We joined this tour to meet and spend time with Boo, the Grizzly bear, which we accomplished successfully, Our tour guide, Niel, was very knowledgeable and engaged us throughout the tour; the tour guide at the Bear’s Refuge area was very informative too, We learned a lot about bear and Banff surroundings. The view of Emerald Lake took our breaths away, Lunch was delicious, overall thumbs up for this tour! We are glad we took it. 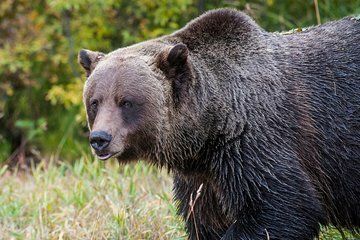 The purpose of the trip was to see a grizzly bear in a 20 acre refuge on Kicking Horse Resort in Golden, BC, Canada. Our guide Hugh picked us up at our hotel in Banff in a comfortable air conditioned bus, which filled up with 24 guests from various parts of the world. This was a 10 hour day which included scenic spots along the way. Hugh is very knowledgeable about bears, so he gave us excellent commentary while enroute. Upon arriving at Kicking Horse Resort we boarded a gondola which took us up the mountain to a ski resort restaurant for a good lunch. After lunch we rode the gondola back to base and then road a chair lift back up the mountain to the bear refuge to see Boo, a 600 lb Grizzly. The refuge is forested, so there is a chance the bear may not appear in the open, but this was a very hot day, so Boo gave us a good show by cooling off in a natural pool of water in his fenced in enclosure. The price of gondola tickets, lunch and chair lift tickets is included in the package. Long day but an excellent trip worth the money. A grizzly bear at close range! How could this trip be anything less than 5 stars? So amazing. The tour guide at the refuge was fantastic, and Neal Neil? E. was a wonderful guide for the day with a lot of knowledge. Several stops to and from the refuge were beautiful, and the gondola ride/chair lift ride were added bonuses. This was a really enjoyable tour with a very informative guide. 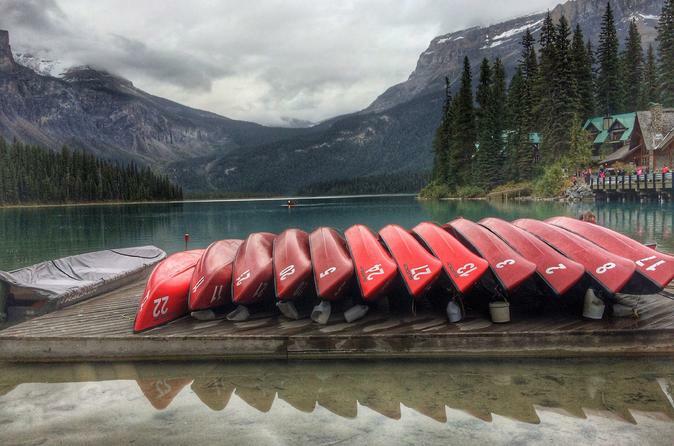 The stops at Takakka falls and emerald lake were wonderful. Also really liked the gondola ride to the top of the kicking horse mountain and had a very nice lunch at the eagles eye restaurant. Then we rode the chair lift to the grizzly bear refuge which was a very lovely experience but sadly we didn't see Boo as he was hiding that day but that can't be helped. This was an excellent day tour! Chris was a fun, knowledgable and caring guide. He was a pretty amazing driver too. My sister and I enjoyed the smaller bus. Our noon meal and restaurant were a nice additon. Ed our tour guide was great . The tour was well organised and he was very informative . We had a great view if boo the grizzly and takkakaw falls was amazing ! This was a great tour. The tour guide was wonderful and very informative. The scenery was beautiful and Boo the grizzly bear was very cooperative. I would definitely recommend taking this tour! Marvelous trip with tour guide Mike who is humorous and knowledgeable and from Australia! Pam was an excellent tour guide. She was very informative and had a great personality. The scenery was beautiful. It was one of best tours I have been on.